One of my favorite beers from last year was Midnight Wheat, the collaborative wheat wine braggot that Jeff and I made last Thanksgiving. To my tastes, the beer has exceptional flavor complexity and aged well. It also scored the highest number of points I have ever received in a BJCP homebrew competition. For all these reasons, I was keen to repeat the beer this year. 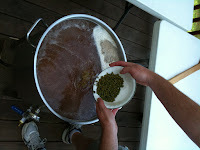 Additionally, my good friend, Kenny, owner of The Fermentation Trap, wanted to brew the beer too. So, we scheduled a double brew day and began planning. We immediately ran into some trouble. Midnight Wheat is a big beer, with over 10 percent alcohol by volume (ABV). To get that concentration of alcohol, the recipe requires a lot of grain. The original 5 gallon recipe called for over 17 pounds of grain and 5 pounds of honey. That amount of grain barely fit into the 10 gallon mash tun, so doubling the amount would certainly exceed its volume. So, we elected to attempt to use two mash tuns and combine the runnings into one brew pot for the boil. This creates some more complicated logistics because the specialty malts need to be divided roughly evenly between the two mash tuns, especially any dark roasted grains. If all of the dark roasted grains went into one mash tun, the resulting mash could become too acidic and impact conversion rates. Big beers also impact the efficiency a brewing system returns. By cramming as much grain as possible into the mash tun, the water to grain ratio decreases because some of the brewing water is removed to fit more grain into the tun. Additionally, the grain receives less sparge water, per pound, then it would for a lower gravity wort. My system usually gets between 70 and 75 percent efficiency for "normal" strength beers (4 to 6 percent ABV), but this decreases to 60 percent efficiency or lower for very strong beers. This lower efficiency resulted in Midnight Wheat requiring an extra 3 pounds of dried malt extract (DME) being added near the end of the boil last year to boost the gravity. For the second batch, I tried to correct this by assuming a lower efficiency and adding more base malt. We still ended up being about 7 gravity points short and did not have the DME on hand to boost it up. 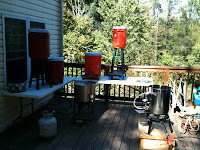 All in all, it was a fun brew session and a gorgeous Fall day to be making beer on the back deck. 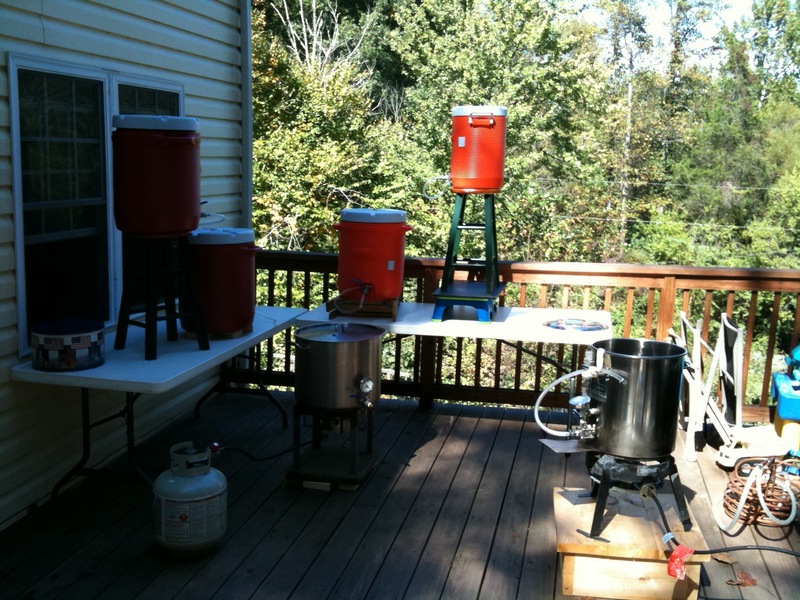 I was glad that Kenny brought his full system along so that we two sparge tanks and a separate burner for additional heating capacity. The beer is bottled now and initial flavor samples contain the complex, layered sugar character that I love so much in the first batch. Time will tell if it is as good as the first batch that Jeff and I made, given that we did not have any of Jeff's fresh Rhode Island honey and we made some hop substitutions. 10/9/11 - Lowered IBUs in recipe from 60 to 40 after double check of last year's calculations showed they were incorrect and actual IBUs in beer was about 40, using Rager. Also, because of lower efficiency than planned, if we do the recipe again, make sure to have DME on hand to boost at end to hit target gravity. 11/2/11 - Beer is very cloudly and carbonated. I did not add gelatin this year, unlike the last batch. The beer smells yeasty and there are hints of the complex sugar character I like so much in the last batch. Flavor is similar to the last batch, but a bit muddled. 11/3/11 - Bottled. Used 4 carb tabs (Muntons) per bottle.